Which is the best Cuisinart espresso maker? The EM-100 and EM-200 are basic pump espresso machines. The EM-400 and EM-600 are capsule-based espresso machines. The EM-1000 is a super-automatic behemoth. The ES1500 is a high-quality professional pump machine for discerning espresso drinkers. So, which is the best Cuisinart espresso maker for you? 7 Which Is the Best Cuisinart Espresso Maker? The Cuisinart EM-100 is a decent low-end pump espresso machine, which is both compact and easy to use. The portafilter locks in easily and can pull two shots at once. The steam wand has convenient swivel functionality and you can control the steam easily by turning the one-and-only knob to the right. A potential downside of this knob is that there isn’t a single “Brew Espresso” button, and that means your brew time isn’t automatic and standard. So make sure you track how long you’ve been extracting! Most espresso recipes call for around 28-30 seconds. The 53 oz water reservoir is surprisingly large for such a compact espresso machine. And despite those compact dimensions, this machine does still have some heft, which I always like in an espresso machine. It also comes with a cup warmer, but honestly, I’m not a huge fan of these cup warming features — I don’t really see the utility. Still, the EM-100 has the area to warm four cups at once. Espresso drinkers looking for something affordable and who don’t mind monitoring their shot’s extraction time. 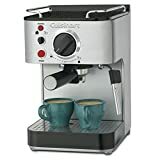 Bottom line: The Cuisinart EM-100 is a serviceable low-end pump espresso machine with an attractive stainless steel exterior and easy-to-use, compact design. It produces fairly good espresso and above average foam, both of which are definitely good enough for the price. The Cuisinart EM-200 has the same build and structure as the EM-100 but adds programmable functionality to take it to the next level. Instead of turning the knob to pull your shot and manually timing the extraction yourself, the EM-200 pulls your shot at the push of a button with no manual timing required. You can customize the volumes, though! However, the manual steam wand does still need to be run and timed by the home barista. The knob to control the steam wand is located on the right side of the machine. Both the Cuisinart EM-100 and EM-200 pull the same quality shots with the same quality foam. These models run on the same internal components — the only difference is the EM-200’s programmable, “push a button” brew options. That gives this machine a better Ease of Use score, but all else is pretty much the same. Espresso drinkers looking for something affordable and easy to use. Bottom line: When you’re shopping for espresso machines in this price range, you know you aren’t getting commercial quality. Understanding that, the Cuisinart EM-200 gives decent espresso and steamed milk at the push of a button from a compact machine. The espresso capsules can brew either short (1.2 oz) or long (3.0 oz) espressos. The coffee capsules brew a 6 oz long coffee. illy makes special iperEspresso capsules, which are blue and are intended to be used with the 3.0 oz long espresso setting. They recommend this to prevent a watery coffee. I wouldn’t go with this machine. 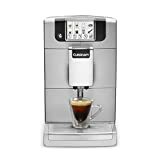 If you want the best Cuisinart espresso maker, look at one of the other models on this list. Possible the EM-1000 if price is no object or the EM-200 if you want to be a little cost-conscious. And if you want the best capsule-based espresso machine, look elsewhere as well. May I direct you to Nespresso? This machine does not come with a frother, so you’re going to have to buy one separately. I’d recommend you go with an Aeroccino frother. If you want a Cuisinart espresso maker and want convenience above else, go with either the EM-400 or the EM-600. If you don’t drink many specialty beverages, like cappuccinos and lattes, then the EM-400 is more your speed because it doesn’t come with a frother. Bottom line: Among capsule-based espresso machines, the Cuisinart EM-400 doesn’t really compete with the leader, Nespresso. If price is a concern for you, you can almost always find a Nespresso machine, such as the Nespresso Inissia or Nespresso Essenza Mini, on sale on Amazon. The Cuisinart EM-600 builds upon the Cuisinart EM-400’s capsule technology by adding an automatic frothing container, which holds up to 22 oz of milk. There are two ways to use this frother. Note that turning the frothing knob to the right creates more froth. As mentioned above: This is not my favorite capsule-based latte system. Both in terms of raw results and value, I’d much rather a Nespresso machine. Perhaps the Nespresso Inissia bundle with a separate Aeroccino frother, or you could go all-in with one of the three Lattissima models. You can read about those on our compare Nespresso machines page. Aside from the additional milk frothing functionality, all of the additional features noted above about the Cuisinart EM-400 (such as 60 minute auto-off mode) apply here as well. If capsules and convenience are what you’re looking for, the EM-600 isn’t the best Cuisinart espresso maker but it definitely is one of the most convenient ones, especially if you want easy cappuccinos and lattes. Bottom line: Like the Cuisinart EM-400 above, I’d rather buy into the Nespresso capsule system. But if you really want a Cuisinart espresso maker and are diggin’ the capsules, then the EM-600 gives you the same thing the EM-400 does plus milk frothing functionality. The “Espresso Defined” model from Cuisinart, the EM-1000 is Cuisinart’s version of an all-in-one super-automatic espresso machine. And it works just like any other super-automatic espresso machine. Speaking honestly, this is not my favorite super-automatic espresso machine. Other coffee makers such as the Gaggia Anima, Gaggia Anima Prestige, and Jura Ena Micro 9 offer better performance and durability for what’s usually a similar price tag. If you’re a Cuisinart fanboy (or fangirl!) and want to shell out big bucks for their best super-automatic espresso machine, you’ll want to give the EM-1000 a look. If you’re OK going with something other than a Cuisinart, you’ll be better served looking at one of our best super-automatic espresso machines under $1,000. Bottom line: A true do-it-all machine, this is the best Cuisinart espresso maker but isn’t the best espresso maker among all brands. Still, it’ll grind your beans for you and make you a latte with the push of a single button, you just have to be OK with the price tag. If you’re familiar with Nespresso, you’ll know the company uses other manufacturers to produce their machines. That means when you buy a Nespresso machine, it’s usually made by Breville or DeLonghi. That’s what’s happening here with the Vero Barista ES1500 Professional Espresso Maker. This model is made by different manufacturers, such as Cuisinart and Waring. Like the EM-100 and EM-200, this model is a semi-automatic pump espresso machine, which means it uses a portafilter with ground coffee and isn’t a do-it-all super-automatic model like the EM-1000. You may recall from the EM-100 review above that I deducted points for not having an automatic brew button like the EM-200. Instead, you had to turn the knob for as long as you wanted extraction to run. You need to do the same thing with the ES1500. Except this time that’s actually a positive! This is a commercial quality espresso maker designed for more experienced baristas. Professional baristas can regulate extraction time a little better and manipulate the resulting shot on purpose by extracting longer or shorter. In conjunction with grind size and tamp pressure, you can get a lot of subtle differences from shot to shot. Also like the EM-100 and EM-200, the ES1500 is E.S.E. soft pod compatible and doesn’t use the illy espresso pods like the EM-400 and EM-600 do. I wouldn’t buy this with the intent of using it for espresso pods, but that functionality may appear to you on some days when you just want something easier. Overall, this is a pretty impressive espresso machine for its price range. It has good heft and an awesome design, similar to some of the very expensive copper espresso machines you’ll find on Amazon. Espresso drinkers who love total control with high quality components and are OK shelling out top dollar. Bottom line: Commercial quality lever espresso machines are a different beast and are designed for a specific type of espresso drinker. If that’s you, you’ll be happy with this machine. Have you ever used on of these models? Comment below with your experience!